WATERLOO — Lauren Caroline Blanchard, 9, of rural Coggon, formerly of Waterloo, died Saturday, Nov. 17, 2012, from injuries sustained in a car accident. She was born Oct. 19, 2003, in Cedar Rapids, daughter of Robb and Amy Fisher Blanchard. 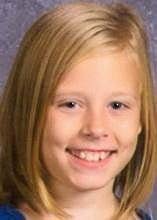 She was a third-grade student at North Linn Walker Elementary. Survived by her parents of rural Coggon; a sister, Taylor Blanchard; maternal grandparents, Rita Forker of Grundy Center and William and Martha Fisher of Marshalltown; paternal grandmother, Shirley Blanchard of Cedar Rapids; maternal great-grandmother, Caroline Praska of Cresco. Preceded in death by her maternal grandfather, Benjamin Forker; maternal great-grandfather, Leonard Praska; maternal great-grandparents, George and Anne Fisher; and paternal great-grandparents, Ivan and Irene Heidt. Services: 10:30 a.m. Monday at St. Stephen Catholic Church, Central City. Visitation from 3 to 7 p.m. Sunday at the church, with a 2:30 p.m. vigil service. Arrangements by Murdoch Funeral Home & Cremation Service, Central City. Memorials may be directed to: the Blanchard Family Memorial, c/o City State Bank, 59 4th St. N., Central City, IA 52214. RYAN – A 9-year-old girl was killed and six other people were injured Saturday afternoon in a two-vehicle collision at an intersection just west of Ryan. Lauren Blanchard of Coggon died of injuries suffered in the crash, and three family members were among the injured. Robbie Blanchard, 41, of Coggon, was driving west on County Highway D47 about 1:40 p.m. Saturday when a northbound car driven by Lucas Kinney, 19, of Manchester, failed to stop at a stop sign and struck the minivan driven by Blanchard, according to the Iowa State Patrol. Robbie Blanchard, Amy Blanchard, 37, and Taylor Blanchard, 6, all of Coggon, were taken to St. Luke’s Hospital in Cedar Rapids for treatment of their injuries, the State Patrol said. Also injured were Kinney and two passengers in his car, David Kounse, 23, of Central City, and Anthony Buisman, 21, of Manchester. Kinney and Kounse were transported via Airlife helicopter to University of Iowa Hospitals and Clinics in Iowa City, and Buisman was taken by ambulance to the Regional Medical Center in Manchester, according to the State Patrol. No condition reports were available last night for the six injured people.